Find My Workspace lists over 95% of the serviced offices market in Adelaide. Simply click Request Quote to check pricing for one office, or Add to Basket for multiple offices. Your business deserves superior performance and cutting-edge technology. This space pushes the boundaries of what shared workspaces mean to businesses. Enjoy Virtual Office solutions with access to collaborative and open plan Coworking space. Alternatively, opt for Hot Desk, Dedicated Desk, or a Private Office. Complimented by stunning views and located in one of the city’s most prestigious buildings, you will also have access to meeting rooms, stylish breakout spaces, and collaborative areas. Network with like-minded professionals and join a community of 40,000+ global clients. Leverage the power of a global interconnected data network, so you can operate your business with uninterrupted efficiencies, all while receiving the support of a dedicated team. Located within one of Adelaide’s only premium property developments in the last five years, this modern, well-appointed centre is situated right on top of a brand-new garden plaza. This is truly one of the most technologically advanced centres in Adelaide, and is the perfect location for building your business. Take advantage of the professional meeting rooms, comfortable break-out areas and communal kitchens, plus you can benefit from the friendly welcome your guests will receive from the on-site staff offering greetings, postal-handling and telephone answering services. Floor to ceiling windows offer you some of the best views around, and the latest technology is available to save substantially on energy, water and air-conditioning. This premium co-working space is ideal for growing businesses, located right on the doorstep of the CBD. Voted Adelaide’s Best Co-working Space in the Qantas Business Travel Awards, this space comes equipped with inclusive amenities, which isn’t limited to high-speed internet and premium meeting room access – the perfect executive environment for hosting those business meetings. Professional development is available in this space, with regular community events offering the perfect networking opportunity for your, your colleagues and the creative growth and development of your business. 24-hour access is also available in this space. This centre is located in a recently refurbished building, offering excellent working conditions in a light and airy environment. This superior business centre offers affordable serviced business suites, and is ideal for small start-up businesses or interstate companies seeking a business presence in the rapidly-developing South Australia economy. If you’re looking for your office and secretarial requirements to be professionally and efficiently managed on your behalf, this centre is the one you need. Offices are available fully-furnished, with high-speed IT provided via Cat-6 cabling, plus virtual office packages are available, if you’re constantly on the move but still need an address for deliveries. This building consists of two floors with offices and meeting rooms on both levels, plus a front-of-house reception area at street level. Each floor has a kitchen and bathrooms, with the second level accessed by stairs at the end of the ground floor hallway. All rates are fully inclusive of furniture, whiteboards, free high-speed WiFi, and unlimited tea & coffee. Serviced offices can be rented by the day, week, or month, whatever your needs. Meeting rooms and classroom are hired by the hour, half-day, or full-day, and a data projector and large screen for presentations are available also for rent. Additional services include: photocopying, printing; & scanning (black and white or colour); laminating, ring binding and cleaning. Limited off-street parking is available at the rear of the building (bookings essential). Catering can be arranged for morning or afternoon breaks, and lunches. 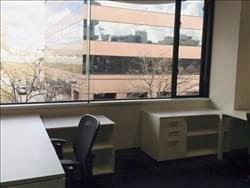 Situated in Adelaide’s CBD these brand new offices are sure to impress visiting clients. You’ll have easy access to your office, as this centre located on the ground floor of this central building. All offices in this centre are bright and fresh, and sometimes you might even forget you’re in the office. An on-site café is located at the front of the building, offering you and your clients a coffee break made easy. This centre offers serviced and virtual offices in this great location, and all space is furnished, with internet included, printing, plus kitchen facilities, onsite meeting area and loads more benefits. To obtain information for your selected Adelaide Serviced Offices, please tick the "Add to basket" box for each office you prefer and complete the form below. We will then send a detailed report via email.